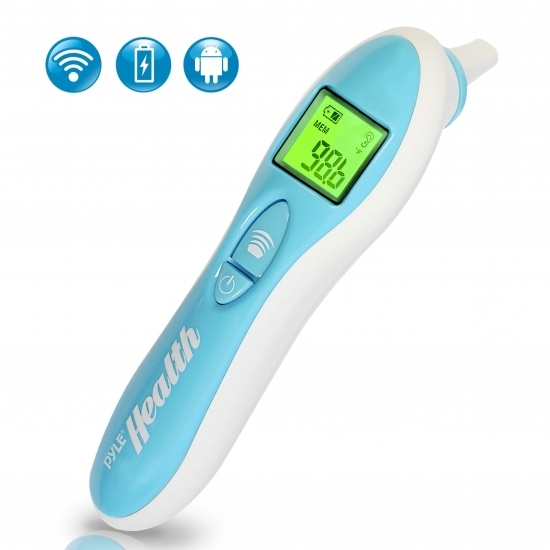 The PHTM10BT infrared thermometer is the latest in health technology. Instantly take the temperature of an adult or child with just the press of a button. Quickly and easily measure the body temperature through the eardrum -- convenient and safe for all ages. Download the free ‘Pyle Health’ Smartphone application and wirelessly transmit temperature data via Bluetooth technology to your mobile device or tablet. The Pyle Health app saves your temperature readings, allows you to view the history of your past readings and the integrated calendar system keeps it all organized. The app also allows you to share your temperature readings with family, friends or your doctor. Use the Pyle Health app to connect to other Pyle Health products and keep track of all your important health data like blood pressure, weight and body temperature. Change the way you keep track of your health with the ‘Pyle Health’ App and the Digital Bluetooth Thermometer! Unit (C/F) Switch When the product is in off state,press and hold power/memory button for 10 seconds until the display shows C or F alternately.Release the button when the display is showing your desired unit. The Pyle Health app needs to be updated, how do I update? We at Pyle also offer the Andesfit health app for Android and Apple. It is the current best app to use with all our Pyle Health BT devices. What is the code to pair with my phone? Do I need to pair it before I use it? Please do not try to pair with this device. There is no need to pair prior to using the Bluetooth. Download the Pyle app and make sure to turn Bluetooth on, on your phone or tablet. Enter your user information on the app. Select temperature and take a reading with the thermometer. It will automatically transmit the data to the app without pairing with the phone or tablet. How do I switch the temperature reading from Celsius to Fahrenheit? Unit (C/F) SwitchWhen the product is in off state,press and hold power/memorybutton for 10 seconds until thedisplay shows C or F alternately.Release the button when the displayis showing your desired unit.